Margaret Brimble, a member of the IUPAC Subcommittee on Organic Synthesis of the Organic and Biomolecular Chemistry Division, received the L’Oréal-UNESCO for Women in Science Award in Paris on 22 February 2007. Professor Brimble holds the chair of Organic and Medicinal Chemistry at the University of Auckland. She received the award for her research on the synthesis of biologically active natural products that provide new lead compounds for the development of new drugs. Based in Paris and now in its ninth year, the annual awards recognize and encourage women scientists. Professor Brimble received USD 100 000 for the award and travelled to Paris for the awards ceremony at UNESCO headquarters, which was attended by 2 000 distinguished guests. Brimble also presented her research to her peers at the highly regarded French Academy of Science. Ameenah Gurib-Fakim—professor of Organic Chemistry and pro-vice-chancellor, University of Mauritius, Mauritius—for her exploration and analysis of plants from Mauritius, and their bio-medical applications. 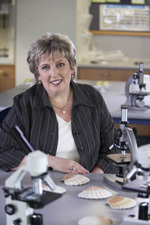 Margaret Brimble—chair of Organic and Medicinal Chemistry, University of Auckland, New Zealand—for her contributions to the synthesis of complex natural products, especially shellfish toxins. Tatiana Birshtein—Institute of Macromolecular compounds, Russian Academy of Sciences, St Petersburg, Russia—for her contribution to the understanding of the shapes, sizes and motions of large molecules. Ligia Gargallo—Department of Physical Chemistry, Pontifical Catholic University of Chile, Santiago, Chile—for her contributions to understanding solution properties of polymers. Mildred Dresselhaus—institute professor of Electrical Engineering and Physics, Massachusetts Institute of Technology, Cambridge, USA—for her research on solid state materials, including conceptualizing the creation of carbon nanotubes. The L’Oréal-UNESCO awards partnership comprises five laureates and 15 fellowships. The laureates are awarded to five eminent scientists for excellence in research, with one chosen from each of the world’s five major regions: Africa, Latin America, North America, Asia-Pacific, and Europe. Laureates are selected based on scientific excellence by a jury of eminent members of the international scientific community led by Günter Blobel who received the Nobel Prize in Medicine in 1999. The main therapeutic areas that Brimble’s research focuses on are treatments for cancer, cardiovascular disease, peptic ulcer disease, anti-fungal agents and Alzheimer’s disease. She describes her group’s work as a complex game of molecular chess whereby chemical reactions reproduce the complex chemical structures of nature. By producing the molecules in the laboratory, improvements can be made and many similar yet unique molecules with even better biological activity can be used to develop new drugs. Brimble’s group comprises 13 Ph.D. students, three honors students, and several postdoctoral fellows. The annual L’Oréal-UNESCO For Women in Science Awards are designed to inspire new scientific vocations while overcoming the gender gap in the world of science and to promote excellence in scientific research. Laureate nominations are submitted from each country via 2000 members of the global scientific community and UNESCO to the awards’ international jury for selection. Page last modified 15 June 2007.